Rahul Dravid is pleased with the players the Bangalore franchise had procured in the IPL auction, and believes his side has individuals who can handle pressure. 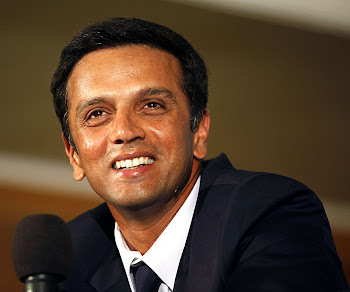 Dravid, the icon for the Bangalore Royal Challengers, played down the talk of his side not buying any big names. "This is an erroneous perception," he told Cricinfo. "The quality of Indian and international players in our team speak for themselves. They may not be glamorous in the areas people typically judge them by, but in terms of cricket they are fantastic and at the end of the day this is a cricket tournament and cricket is what is important. "We are fortunate to have such great players in the side. With them in the squad, we will get so much more experience and ability." Unlike the others, the Bangalore franchise preferred innings builders, like Jacques Kallis, Wasim Jaffer and Shivnarine Chanderpaul, to aggressors. "We have players who have played under pressure," Dravid said, "and therefore are confident that under similar circumstances in the Twenty20 matches, they will perform exceedingly well." Although the franchise bought Anil Kumble, they failed in their bid to purchase Robin Uthappa, another Bangalore-based playing for India. Uthappa, who was bought by the Mumbai franchise for a whopping US$800,000, would have not only provided a balance to Bangalore's batting line-up but his purchase would have helped fill up one slot among the four catchment area players. "As a Bangalore player, I obviously would have liked to have had Robin, who is from our catchment area, in the team," Dravid said. "However, in an auction where there are rules and restrictions, it is not always possible to get every player one wants. "In fact none of the teams were able to get all the players they would have liked to. However, having said that I would like to add that I am excited with the team we have got." On the potentially match-winning bowling attack that his team has lined up - Dale Steyn, Nathan Bracken, Zaheer Khan and Anil Kumble, Dravid said, "The idea was to have a good balance, which is very important for the tournament." Dravid said Australian allrounder Cameron White, whom Bangalore bought for US$500,000 at the IPL auction, was an "exciting" addition. "I think people are getting a bit confused by the price aspect. It's just reflective of the current situation in cricket and what people want. White is a very exciting Twenty20 player and his domestic record [with two Twenty20 hundreds]in Australia is phenomenal. He was always on our wishlist." Asked whether he viewed the 44-day Twenty20 tournament starting in April 18 as a platform to stage a comeback into the India one-day team, Dravid said: "I am not looking at this that way. To be honest, this is something new for all of us. There are so many things you want to experience as a player. Personally, I have seen and experienced a lot over the last 12 years [in international cricket]. Now, I am just so glad that at this point of my career, I will be a part of this new experience." Dravid didn't want to divulge much about the strategies that his side were planning to adopt during the 44-day tournament, set to start on April 18. "It is still too early for me to comment on this. At the moment I am focused on getting fit after my finger injury and preparing for the Test matches against South Africa."